The Dvorak layout. Dvorak is an alternative to Qwerty. It is a keyboard layout designed to minimise movement, and make typing as easy and painless as possible. The idea behind it is to have the most commonly typed keys under the fingers, and make it as easy as possible to type common words and combinations of letters. Over the years several slight variations were designed by the team led by Dvorak or by ANSI. These variations have been collectively or individually also called the Simplified Keyboard or American Simplified Keyboard but they all have come to be commonly known as the Dvorak keyboard or Dvorak layout. 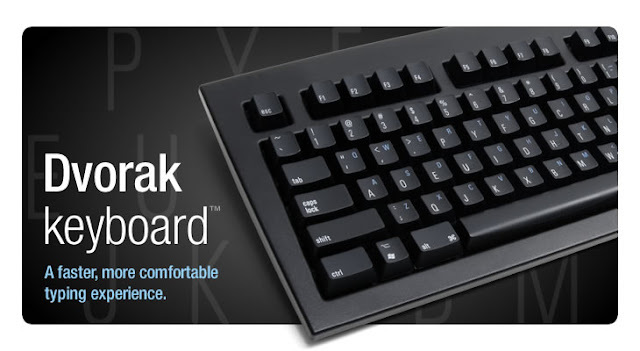 Dvorak proponents claim the Dvorak layout uses less finger motion and reduces errors compared to the standard QWERTY keyboard. This reduction in finger distance traveled is claimed to permit faster rates of typing while reducing repetitive strain injuries, though this has been called into question and their criticism has in turn also been called into question. Although the Dvorak Simplified Keyboard (DSK) has failed to replace the QWERTY keyboard, most major modern operating systems (such as Windows, OS X, Linux, Android, Chrome OS, iOS (via a third-party keyboard), and BSD) allow a user to switch to the Dvorak layout. Currently, BlackBerry 10 and the Windows Phone do not support a system-wide, touchscreen Dvorak keyboard. Take another look at your keyboard. Are you really happy using something that intentionally slows you down? Something that makes you move your hands and wrists far more than is necessary? Would you not rather use something that was designed to make your life easier?